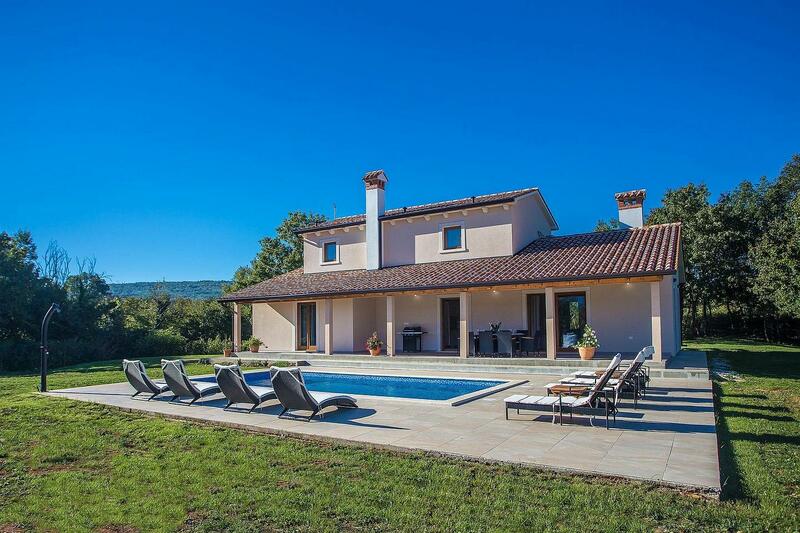 Villa Flora is newly built holiday home with swimming pool in Krsan near Labin on the east coast. There you will find a grocery store, cafe bar and a restaurant. The closest beach is only 7,5 km away, in Plomin Luka. In the vicinity are several well-known agrotourism where you can try some of the local dishes. 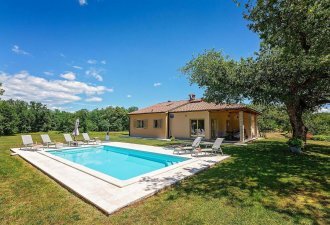 On the 4000 sqm big property on guests` disposal there is a swimming pool of 32 sqm, 8 sun loungers, big covered terrace with dining table and portable barbecue, trampoline and swing for the youngest and parking for four vehicles. Villa Flora of 140 sqm on two floors. On the ground floor there is an airconditioned living room, dining area and fully equipped kitchen with an exit to the terrace, shower/toilet in the hallway, one bedroom with two separate beds and one bedroom with double bed (180x200) and an exit to the terrace. On the first floor there is one double bed bedroom (160x200) with en suite shower/toilet, one double bed bedroom (160x200) with en suite bath/toilet, one balcony that is approachable from the hallway. The bedrooms on the upper floor are airconditioned. Es waren wunderschöne Tage in diesen sehr schön eingerichteten Haus. Wir sagen vielen Dank und kommen bestimmt wieder. Wirklich schön.